Scroll down for the #bcsm conversation report for July 18th, 2018 EST. When it comes to participants, we ranked 98th among 544 conversations. In terms of the number of posts, we ranked 99th out of 544 conversations that took place. This conversation ranked 69th out of 544 in terms of the amplification of ideas & content. There were 36 reshares, 62% of posts, during the course of the conversation. 64% of participants in this conversation shared a total of 8 unique pieces of content. Healthcare publisher of oncology focused articles, videos, panel discussions, and much more that run the gamut of oncology care and management. METUP is committed to changing the landscape of metastatic cancer through direct action. 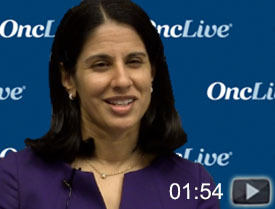 Sara M. Tolaney, MD, MPH, instructor of medicine, Harvard Medical School, attending physician of medical oncology, Dana-Farber Cancer Institute, discusses the phase Ib results of abemaciclib (Verzenio) plus pembrolizumab (Keytruda) for hormone receptor-positive, HER2-negative metastatic breast cancer.